There was a time when I never would have imagined myself a serious runner. I was one of those klutzy kids that was very skilled at tripping over non-existing obstacles, and was usually towards the back of the pack when it came to choosing teams in gym class. I was, however, somewhat talented with a pencil or paint brush, so my athletic skills (or lack there of) didn't bother me (much). Fast-forward to adulthood. I did a few 5K's with friends, and then with the husband. I usually had to walk some of the distance, though. Finally, I found the motivation to train for and run a complete 5K. It took a couple months, but I was able to do it.....I ran a 5K nonstop! It was a proud moment for this "non-runner" to cross the finish line of a real race knowing that I had, indeed, run the entire distance. Fast-forward a few more years, and I was completely happy and content running those 3 miles. Never any less than 3 miles, but never any further. I acquired quite a collection of race bibs from numerous 5K's. My race times had progressively improved and I felt like I had made a worthwhile appearance in the local running scene. 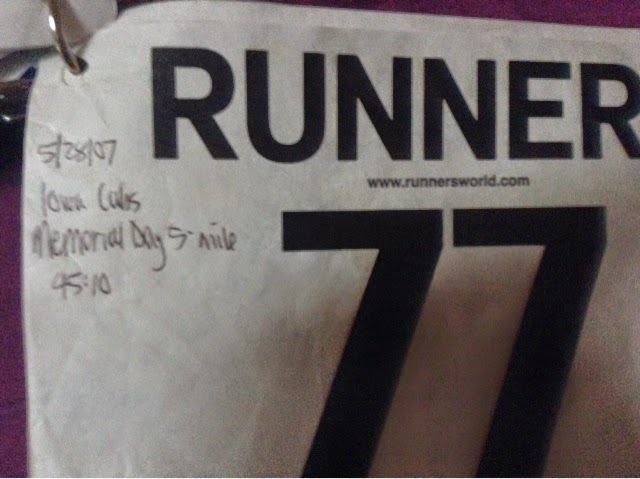 Then one day the husband tells me he registered us for a 5-mile race, and this 5-mile race was in few weeks. YIKES! What was he thinking? I wouldn't have time to train for a 5-mile race, not with only a few weeks notice. I could easily run 3 miles, but 5 miles was almost twice as far..... almost twice the distance of my "comfort zone" distance. I spent a few days being angry at the husband, and frustrated with myself. This race was going to be a total disaster, there was no way I thought I was capable of running five miles without walking some of it. My mind kept flashing back to all the previous races when I had to walk. After having conquered several races where I was able to run non-stop from start to finish, I didn't want to go back to walking. Finally, I realized that I should just run the first three miles without worry (since I already knew I could go that far), and I could spend the next couple weeks trying to run a little farther on some of my runs. I probably wouldn't be able to run the entire 5 miles, but I could still make it to the finish line if I started off slow and walked periodically. Not my ideal scenario but, given my limited time frame, it would have to be my plan of attack. Race day arrived, and I was a nervous mess. The race didn't start until 10:00AM, and it was already feeling warm at packet pick-up an hour prior. 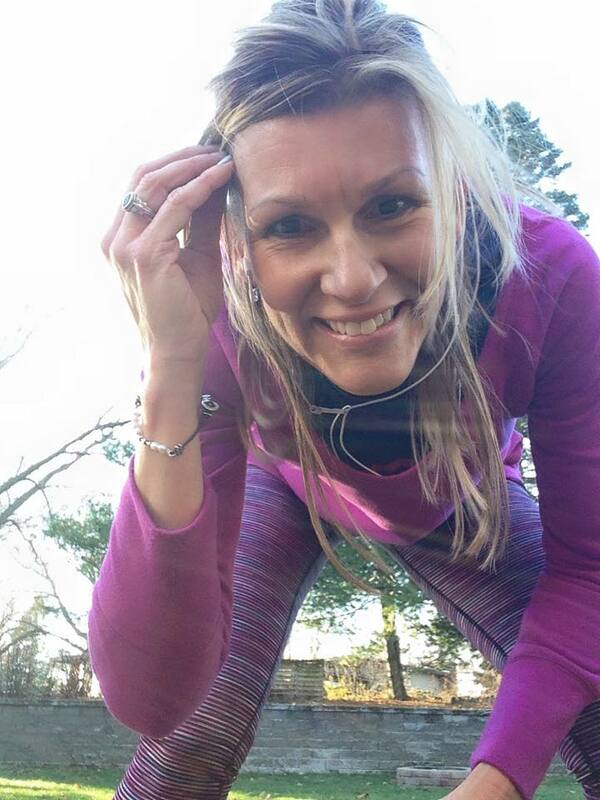 I tried to concentrate on stretching to take my mind off the five miles looming ahead of me. I noticed a lot of "real runners," the people with expensive-looking shoes and fancy sunglasses. They all looked confidant and eager to sprint across the start line. They weren't nervous about finishing strong (or finishing at all). Before long, it was time to line up. I was still annoyed with the husband. He is much more athletic than myself, he didn't have the fear of not finishing on that warm morning. He didn't understand why I was so worried about this race. To him, it was just a race, a fun race, it didn't matter how fast (or slow) we ran it. To me, though, it was all about NOT disappointing myself, and crossing the finish line with some dignity. The gun fired and we were off and running. It took a lot of effort to just run easy because so many others were running fast. I knew I needed to take it slow and conserve some energy, I had to resist the urge to follow the crowd and run my own pace. Despite the warm and humid temps, we did have quite a bit of shade from the downtown buildings. I made it to the first mile and felt fine. I walked for a few seconds as I gulped some water from the aid station. The husband and I continued on, not talking (I was too afraid of getting winded), but keeping in stride with each other. We made it to the second mile, still feeling fine. As much as I was annoyed that he was purposely running slower to stay with me, I did appreciate having him there. He probably knew better than to leave me in his dust. As we approached the water stand at the third mile, I felt both relief that I was not fatigued, but also apprehensive that I was about to pass my normal "finish line" and keep going. So, we pressed onward. About halfway through the fourth mile it occurred to me that I had not walked yet (except for a few steps through the water stations). And I got the idea in my head that I kind of needed to use a restroom. As luck would have it, there was a public restroom right before the start of the fifth mile, so I took advantage of it. Even though I didn't feel tired, I was certain I would be if I didn't take a break and walk a bit. After all, my body had never run this far before, I didn't want to risk anything. I told the husband I needed to walk for a minute. He reminded me that we were almost finished, why not just press on but go slow and easy? Frustrated, I told him to go on but I was going to walk. He relented, and we walked for a few minutes. 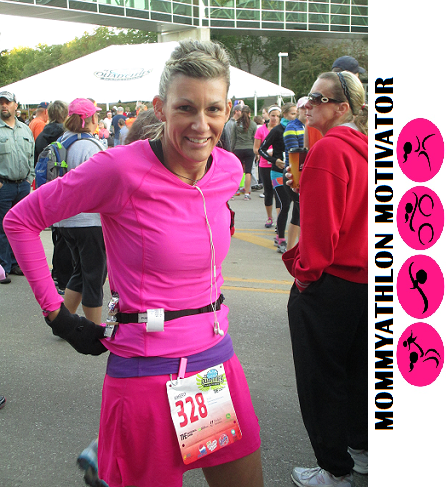 We broke back into an easy pace, and my attitude transformed as we finished the final mile. My anger and annoyance mellowed as we approached the finish line of that 5-mile race. The husband even pretended to trip, allowing me to cross the finish line first. Our finish time was 45:10, a 9-minute pace. It turns out, I actually ran the 5 miles at the same pace I had been running most of my 5K's, and it really wasn't any more difficult, just longer. Hmmm. Getting out of my comfort zone wasn't so bad after all. Maybe I should have done it sooner. Fast forward a year later (2008), we ran the race again and I not only PR'd, but I placed third in my age division. A few days later, I ran my first of many 20K's/ half marathons. And on September 22, 2013, I ran my first full marathon. I'm thankful for running away from my comfort zone, and I do my best to stay away from it now. How about you? A huge part of me sharing my running "life" with the world is that I am going to be real about my journey. I love all of my accomplishments, but these accomplishments wouldn't have much value without conquering obstacles along the way (and being reminded, repeatedly, that I am not any more special or talented than anyone else). Case in point, I had a 10-mile run on my agenda for yesterday. 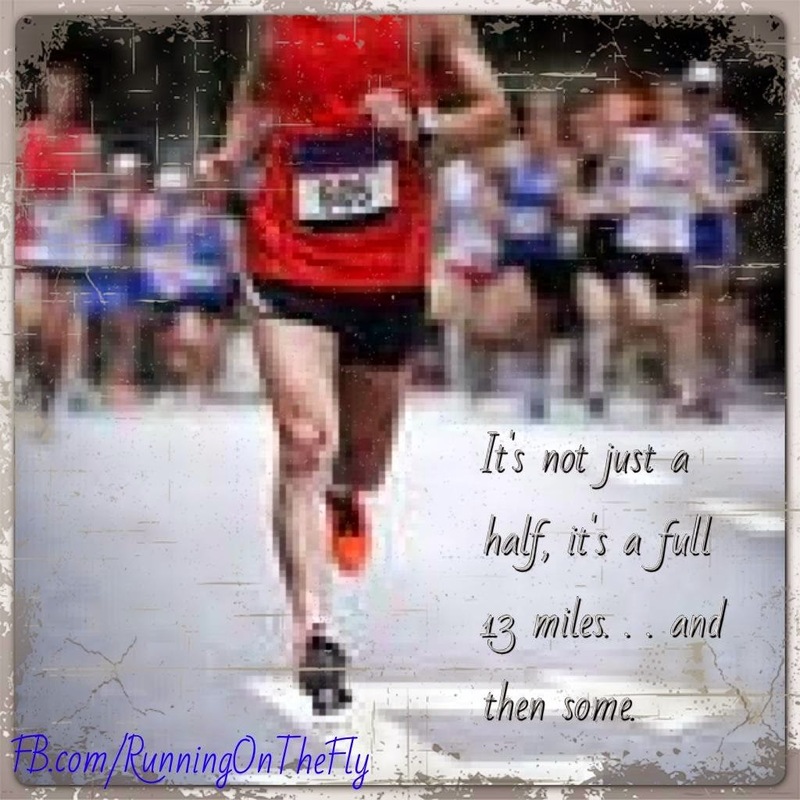 I have run many 10-milers in the past six years that I have considered myself a distance runner. They are not difficult, but do require a little bit of forethought in terms of carb-loading, hydration and fueling. Saturday morning arrives, and although I had been eating well and drinking plenty of water in the couple days prior.....I kind of over-looked those small (though very significant) details that morning. It was cloudy, so I putzed around on the computer (procrastination at its best) and waited for the sunshine to emerge. The temps were forecast to be in the 70's and I was eager to have a nice run in the beautiful spring weather. I took my time in getting the running clothes on, and had a quick bowl of oatmeal and glass of water before heading out (which wasn't until just after 11:00). As I started on my run, I noticed my upper hamstrings were a bit stiff. I had done a hill-repeat workout on Thursday evening; it wasn't a very long workout, but a bit intense. These stiff muscles were probably a result of that, and I assumed they would loosen up after the first few miles (wrong!). The first few miles drudged on, which is typical for me, so I just kept going, waiting for the magic to appear around mile 3 or 4, usually when all stiffness disappears and my body kicks into "robotic mode" and just goes on its own. The sunshine was beautiful, but there was a strong wind coming out of the south. Not gusts of wind, but continuous wind. The wind was so powerful, I could feel it from every direction, even the cross wind was tough to battle against. That's when it (finally) occurred to me that I probably should have eaten more than a bowl of oatmeal. If I would have left the house a couple hours earlier, this wouldn't have been a problem, but waiting around until 11:00 with only a bowl of oatmeal in my stomach (and not much water) was pretty risky. Around mile 4, I could feel the early signs of fatigue beginning. I have done a few races where I have had major carb crashes, and I know what the early signs of that feel like. Running 4 miles is not a big feat, but factoring in the wind made it much more of a challenge than normal. I could feel my form starting to suffer, so I slowed down and walked briefly to catch my breath. I continued on, finished mile 5, and walked a few times before finishing mile 6 at my house. I went inside, and grabbed a granola bar and had some Nuun water. I also ate a few fruit snacks. I was surprised I made it back in less than an hour. I didn't have my watch with me, so I had no idea what my pace was. Apparently, I was running harder than I thought, since I was under a 10-minute pace even with the intermittent walking. I grabbed a couple of Gu energy chews and headed back out. Miles 7 and 8 went pretty smooth, although my hamstrings continued to feel a little tight. Similar to the other times where I have carb crashed while running, my muscles didn't feel too much strain but my energy level took a nose dive. I walked briefly before mile 9, then walked about the last half of mile 10. Although my legs didn't feel tired, I could tell my form was a mess from the lack of energy, so I allowed myself to walk more than I really wanted to. 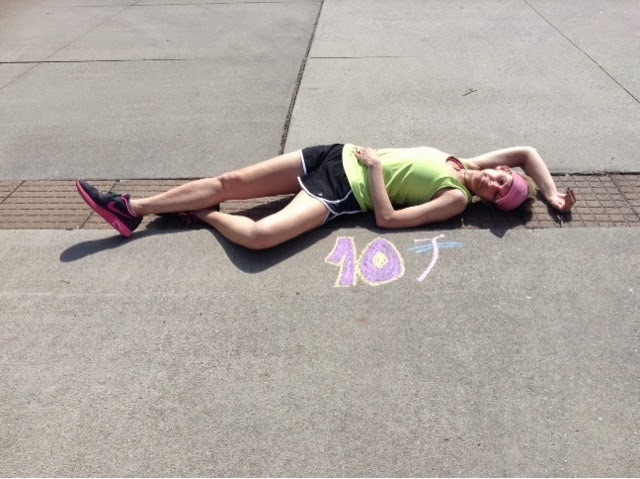 I was doing the Cancer Ends With Me 10-mile Challenge, a virtual run. I had no one to impress but my ego, but I was determined to do a solid 10 miles instead of just quitting after mile 6. 4--Not every run or race will be ideal or fun. Use the not-so-fun runs as valuable conquests on your journey to the next great run, you will appreciate the victory much more in doing so. I have a half marathon in two weeks, and I am ready. I may or may not do a long run next weekend. I really have nothing to gain by doing one, so I'll probably just do some moderate runs (5-7 miles) to keep things ready for race day on April 27th. Life is Good! Have you ever had a bad run followed by a great race? Half marathon. 13.1 miles. My favorite of all favorites. The half marathon is definitely my favorite distance. It's a long distance, so it takes some devoted training and discipline to conquer. But it's not out-of-reach, and it will not take several months to get your body (and mind) prepared. Are you interested? Ready to up your game? Here's some suggestions if you're ready to go the distance. It's best to have a running base. It's not a requirement, but a strong recommendation. If you've been running for awhile (a loose term, and a very subjective one at that), you will have an idea of your body's condition, your normal pace and maximum distance. You will know how to warm up, pace yourself while in motion, and you'll (hopefully) know the benefits of stretching, injury prevention (or treatment) and recovery. Should you hire a coach or go with a training plan? If this is your first 13.1 (or long distance race), you will benefit from the knowledge of someone who has done this before (whether it be a coach or an experienced friend). There are as many training programs available online as there are runners searching for them. Some programs are free, some are not. Whatever the case, try to find a program that has a similar schedule to what you're comfortable with. If you like to run 5-6 days a week (and your body is used to running that frequently) or if you prefer to run 3-4 days a week (and do cross-training on the non-running days)....there are training plans that will fill those needs. If you use a coach, they will be able to customize a plan for you based on your strengths, needs and race day goals. The key to training for a long distance event, though, is building up your distance. It's best to do this gradually, usually over the coarse of 8-14 weeks (again, depending on what kind of a running base you have). Most training plans will have you running somewhat short distances a few times during the week (one run might even be a speed workout), and then doing one long run (usually on the weekend). The long run is just that...a LONG run. It's not meant to be a quick run, or a hilly run, or an interval run. It's meant to be a long run, and each week you should gradually make it a little bit longer (maybe increasing the distance each week by a half mile, or even a full mile....but only on your long run). 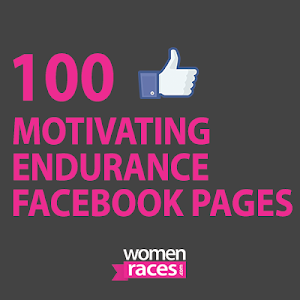 Most training plans for half marathons will have you running up to 10 miles. A lot of first-timers are fearful that this isn't far enough. You have to have faith in your training, and trust your body's ability. By the end of your training, you will have invested anywhere between 8-14 weeks in preparing. You (hopefully) have gradually increased your distance consistently and remained injury-free. If your body can run 10 miles, it will be able to run an additional 3.1 miles on race day. Trust me, it will. Most training plans also will have a taper, a period (usually 1-2 weeks prior to race day) where you have minimum running on the schedule. Tapering is another "necessary evil" in preparing for any kind of a distance event. It gives your body time to rest (and recover, if necessary) and arrive at race day fresh and ready. Do not be tempted to run "just a little extra" during your taper. You risk injury, and it's best to save some of that nervous energy for the actual race itself. The long runs also help you prepare mentally for race day. The long runs give you a chance to experiment with different kinds of fuel (Gu gels? Energy beans? Honey stingers? ), water strategy (fuel belt with water bottles? hand-held bottles? water "planted" on your running coarse? ), and clothing (how many layers? hat or visor? which shoes? wool socks?). Also, how will you carry your fuel or snacks? In a fuel belt? in pockets? Make sure to practice these maneuvers on your training runs (pulling off a layer and tying it around your waist, ripping open a Gu pack while running with sweaty hands, gulping water out of a cup, etc.). A lot of runners train on treadmills, especially through the winter. I recommend doing some of your training runs outside, though, especially your long runs. Your race will be outside, why not give yourself the advantage by training outside as well? The outside conditions are different than those inside a gym....there will be wind resistance, humidity, uneven terrain, occasional puddles, bright sunlight and sometimes pebbles or sticks to test your traction. If you train with the "outside" elements, nothing should surprise you on race day. We all have heard it, but probably the best advice for race day is to NOT do anything new or different than what you did in training. This is not the day to break in the new shoes you purchased at the expo and don't be tempted to wear the event shirt. Try to eat something at approximately the same time you normally would eat before a long run. Drink some water, but don't drink more than usual. And be sure to make one last stop at the porta pots before lining up (you may regret not doing it!). Also, try to enjoy the race as much as possible. I tell runners to do their first 13.1 for fun (and not to worry about their finish time), smile as much as you are able to and thank every volunteer you come in contact with. Try to high-5 the kids along the route, as well..... you'll make their day great (and you'll get a much-needed dose of "feel good mojo"). Be thankful and proud of yourself for making the commitment to be there. What do you say? Are you ready? Go for it! !